I recently bought a new Home Lab so I can tinker around with new, cool technology like Docker, DC/OS, Azure Stack and unikernel stuff. The lab server I bought really is cool: it’s a Xeon D-1500 series based home lab. The Xeon D-1500 processor family is a low-power, high-performance System-on-Chip processor based on the 14nm Broadwell architecture. It has all the processor features any home lab needs, like hyperthreading, VT-x and VT-d, EPT, AES-NI, NSX-NI, Trusted Execution, Execute Disable Bit and finally, SR-IOV (with some caveats; see below). These processors have been on the market since Q4 2015 (as the 15×0 series), and have seen a 15×1 hardware update in Q1 2016. There are currently (as of May 2016) 17 different models, differencing in number of cores, frequency, amount of cache and power usage. According to Intel ARK, some specific processors take only DDR4 memory, while most accept both DDR3 and DDR4. There are also small differences in USB2.0 vs. USB3.0 support, number of SATA ports and integrated network cards (dual 1Gbit, dual 10Gbit or both). As this is a System-on-Chip processor, it comes soldered onto the motherboard. When selecting a Xeon D-1500 system, I’d recommend picking the processor first. For me, the form factor (mini tower), the power usage (60 Watts average) and performance (128GB RAM, enough processor cores, cache and frequency, insanely fast NVMe storage) are the ideal combination to build a home lab. 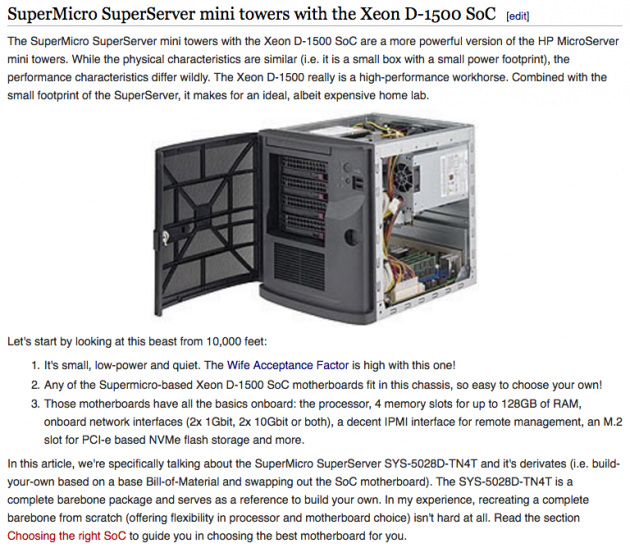 In fact, I’ve been so satisfied with my set up, that I’ve written up an article on the new Open Home Lab site to share my experiences with the SuperMicro-based Xeon D-1500 SoC, and I want to encourage you to read, add, edit this article to share all your experiences with the Supermicro-based Xeon D-1500 series home lab! The SuperMicro SuperServer mini towers with the Xeon D-1500 SoC are a more powerful version of the HP MicroServer mini towers. While the physical characteristics are similar (i.e. it is a small box with a small power footprint), the performance characteristics differ wildly. 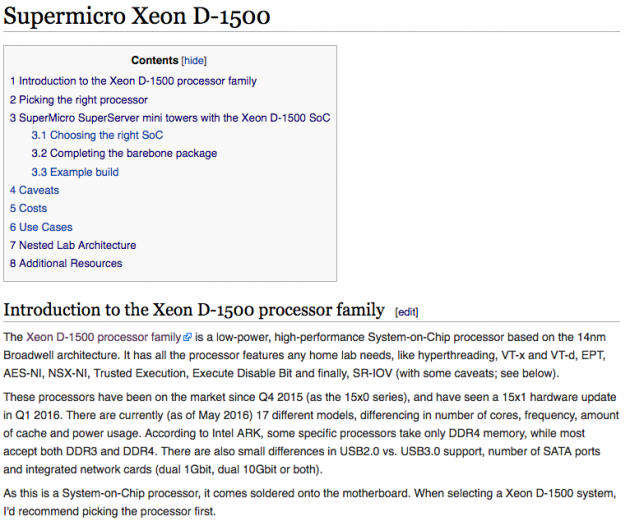 The Xeon D-1500 really is a high-performance workhorse. Combined with the small footprint of the SuperServer, it makes for an ideal, albeit expensive home lab. It’s small, low-power and quiet. The Wife Acceptance Factor is high with this one! Any of the Supermicro-based Xeon D-1500 SoC motherboards fit in this chassis, so easy to choose your own! Those motherboards have all the basics onboard: the processor, 4 memory slots for up to 128GB of RAM, onboard network interfaces (2x 1Gbit, 2x 10Gbit or both), a decent IPMI interface for remote management, an M.2 slot for PCI-e based NVMe flash storage and more. Fantastic work, Joep, so appreciative of all your efforts, pulling all that information together. It’s great for everybody! Likewise, Paul. Your blog post series has helped me getting this lab up and running in the first place! Do you have to install a RAID card in this server to get decent write speeds with ESXi 6? No, if you’re using an NVMe drive, you don’t need (or even can use) a RAID card. Any info on cost of hardware, etc? I recommend you get pricing information from a local vendor, as prices vary from country to country! I need Build a Home Lab. You buy one by one part from this server?